We review recent results on pattern selection in the one- or two-dimensional reaction-diffusion system xt - Δx = f(x, y, λ), y t = εg(x, y), subject to global (〈x〉 = x 0) or long-range interaction; the source functions may be realistic kinetic functions or simple cubic or quintic f(x) functions for which the system admits inversion symmetry. 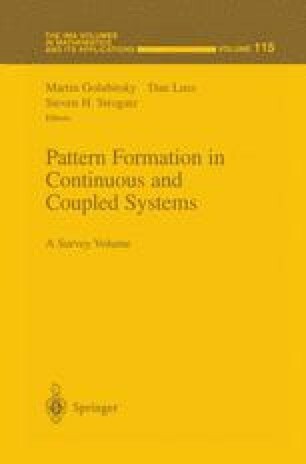 This review discusses: (i) physical sources of such interactions and experimental observations in catalytic and electrochemical systems; (ii) the main emerging patterns and their classification according to their symmetry; (iii) the bifurcation between patterns; (iv) patterns when f(x) = 0 is tristable and can sustain several fronts. The rich class of patterns simulated in a ribbon can be classified as stationary-front solutions (including oscillating fronts and antiphase oscillations) and moving pulse solutions (unidirectional, back-and-forth and source-points). Patterns on a disk may be classified as circular (including oscillatory or moving target patterns), rotating (stationary or moving spiral wave) and other patterns.